This is how it feels sometimes…. 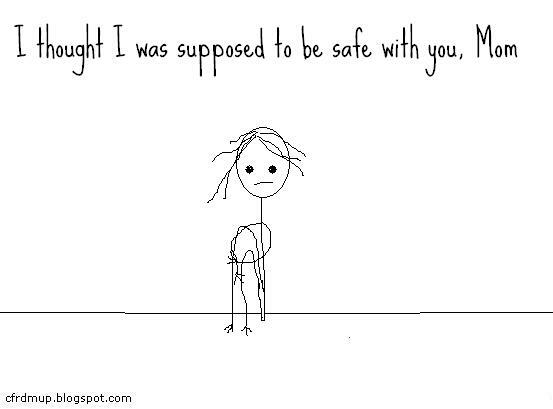 I was supposed to be safe with you. Please visit this blog. please…. ~ by Step On a Crack on January 30, 2012. Isn’t this SO SAD! I feel so for the woman who drew it. I am making my way through this mess. An ACA meeting is on tap for tomorrow; I need to get back to what I know works. my dad always said, “What doesn’t kill you makes you stronger,” and he was always right. With my Gods help I know I will come out the other side stronger than I am now. I KNOW!!!! I thought of you instantly. I don’t know why we can’t comment. I wanted you to see this woman’s stuff and posting it here seemed a good way to share. SO powerful!!! Jen is that you? Is that one of your aliases? no way man. I leave the art to you my Love…. My line is a different..”You should have known..” Recently I shut the world out for a day or two and had my own house krai for the little girl I knew. After reading this I am going to do it again. I so get your recent posts and when I get the strength to put my thought down I will. Thank you for having the courage to be honest it has made me also face my demons. May Jesus always go ahead of you and all those like you and make your crooked places straight. You too, sing my song, the song I did not know to sing. I hope the House Krai gave some relief. Mine is scheduled for Saturday. Thank you for such a powerful ritual. Maiya, I can never tell you what your poetry has meant to me. Jesus is moving ahead of me. I need to open my EYES to see that. I do. thank you. Thank you for sharing this drawing. Simple and powerful, the voice of our “child”.